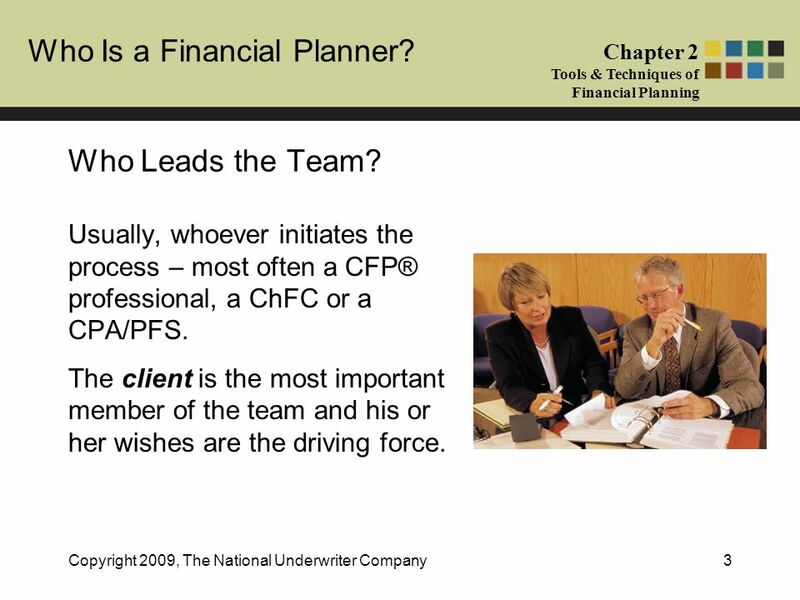 1 Who Is a Financial Planner? 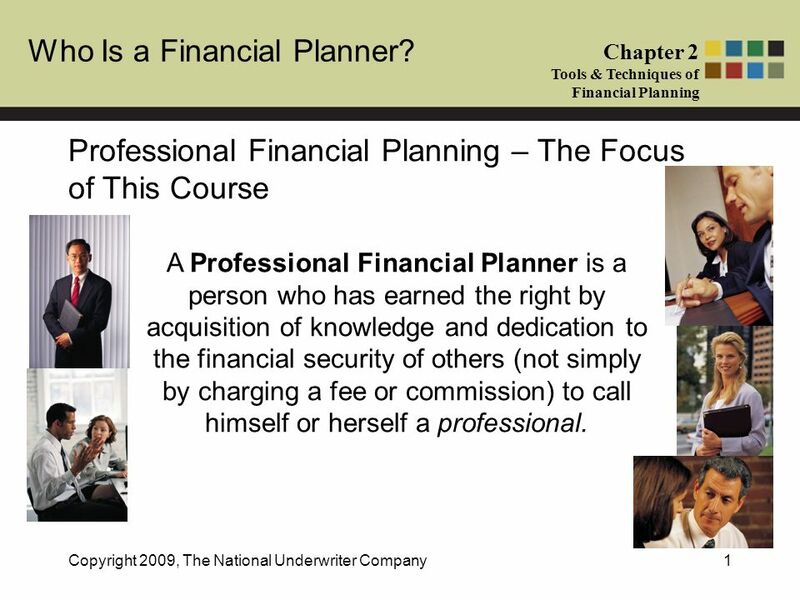 Chapter 2 Tools & Techniques of Financial Planning Copyright 2009, The National Underwriter Company1 Professional Financial Planning – The Focus of This Course A Professional Financial Planner is a person who has earned the right by acquisition of knowledge and dedication to the financial security of others (not simply by charging a fee or commission) to call himself or herself a professional. 2 Who Is a Financial Planner? 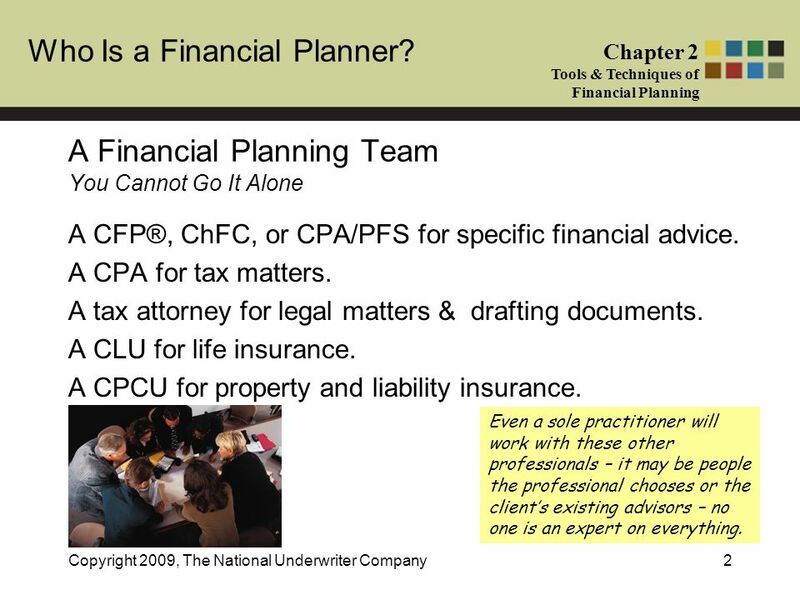 Chapter 2 Tools & Techniques of Financial Planning Copyright 2009, The National Underwriter Company2 A Financial Planning Team You Cannot Go It Alone A CFP®, ChFC, or CPA/PFS for specific financial advice. A CPA for tax matters. A tax attorney for legal matters & drafting documents. A CLU for life insurance. A CPCU for property and liability insurance. Even a sole practitioner will work with these other professionals – it may be people the professional chooses or the clients existing advisors – no one is an expert on everything. 3 Who Is a Financial Planner? 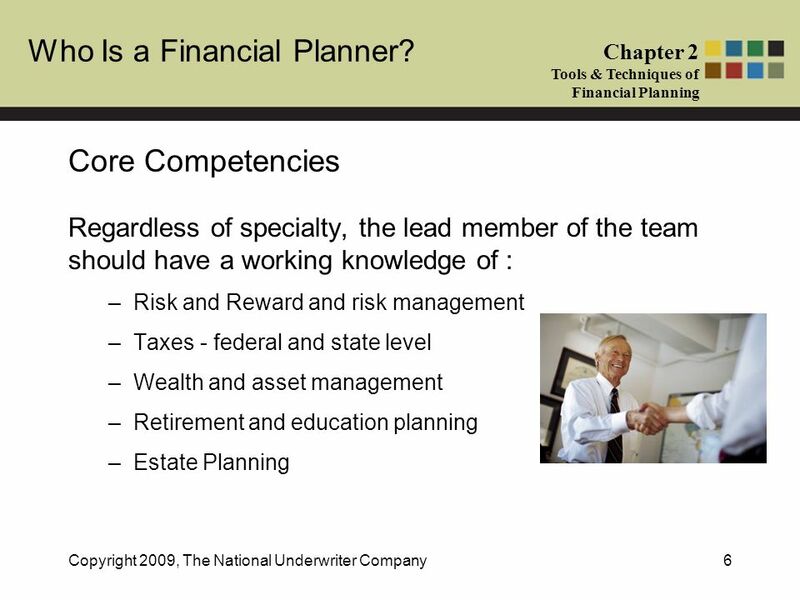 Chapter 2 Tools & Techniques of Financial Planning Copyright 2009, The National Underwriter Company3 Who Leads the Team? Usually, whoever initiates the process – most often a CFP® professional, a ChFC or a CPA/PFS. The client is the most important member of the team and his or her wishes are the driving force. 4 Who Is a Financial Planner? 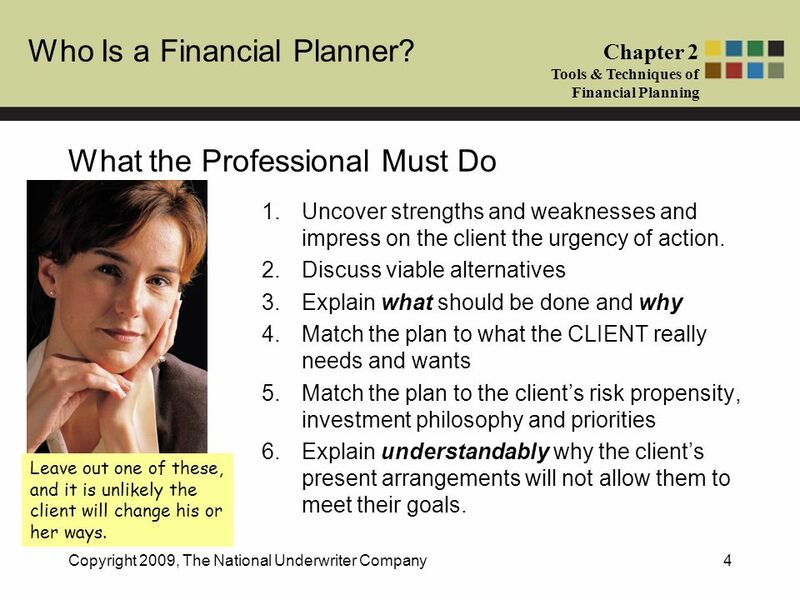 Chapter 2 Tools & Techniques of Financial Planning Copyright 2009, The National Underwriter Company4 What the Professional Must Do 1.Uncover strengths and weaknesses and impress on the client the urgency of action. 2.Discuss viable alternatives 3.Explain what should be done and why 4.Match the plan to what the CLIENT really needs and wants 5.Match the plan to the clients risk propensity, investment philosophy and priorities 6.Explain understandably why the clients present arrangements will not allow them to meet their goals. Leave out one of these, and it is unlikely the client will change his or her ways. 5 Who Is a Financial Planner? Chapter 2 Tools & Techniques of Financial Planning Copyright 2009, The National Underwriter Company5 More About What a Financial Planner Must Do Results of a College for Financial Planning Study* Evaluate client needs Explain financial planning concepts Clarify client goals Analyze information Prepare comprehensive financial plans Implement comprehensive financial plans Monitor comprehensive financial plans Establish and maintain accurate records and perform other professional functions. *Study by Dr. Larry Skurnik. 8 Who Is a Financial Planner? 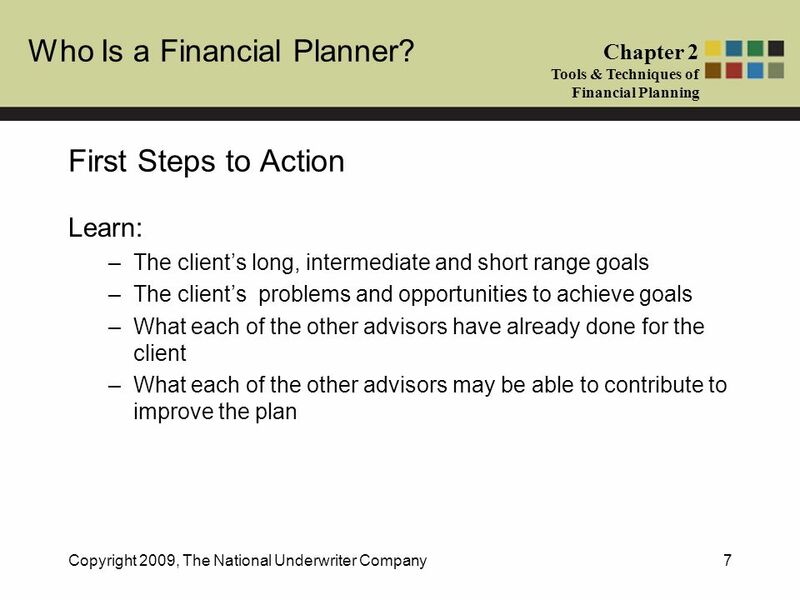 Chapter 2 Tools & Techniques of Financial Planning Copyright 2009, The National Underwriter Company8 Client Centered Planning Give the client ample opportunity to express his or her goals. Make sure that the client understands each recommendation and why it is being made. 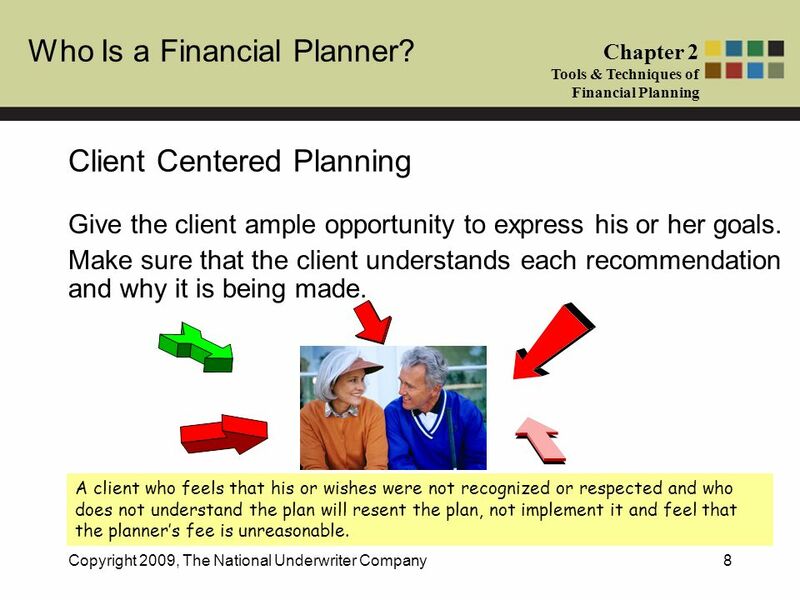 A client who feels that his or wishes were not recognized or respected and who does not understand the plan will resent the plan, not implement it and feel that the planners fee is unreasonable. 9 Who Is a Financial Planner? 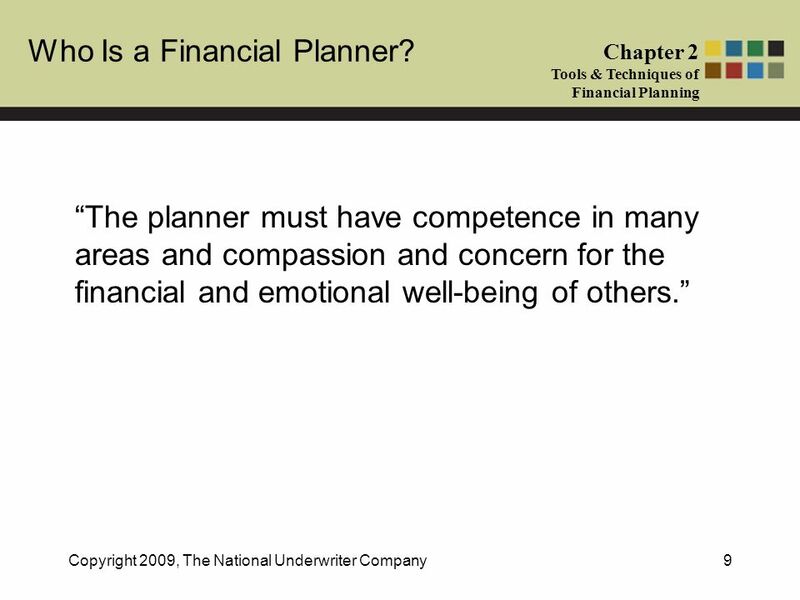 Chapter 2 Tools & Techniques of Financial Planning Copyright 2009, The National Underwriter Company9 The planner must have competence in many areas and compassion and concern for the financial and emotional well-being of others. 10 Who Is a Financial Planner? 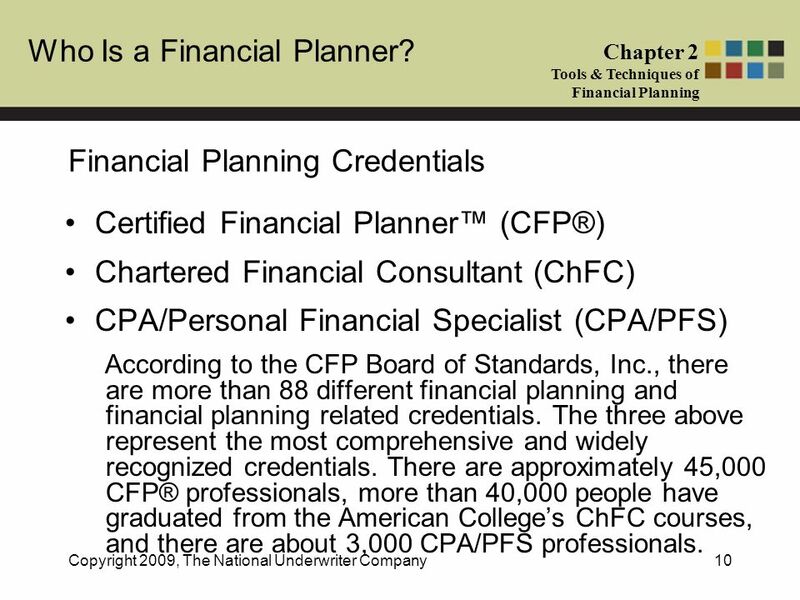 Chapter 2 Tools & Techniques of Financial Planning Copyright 2009, The National Underwriter Company10 Financial Planning Credentials Certified Financial Planner (CFP®) Chartered Financial Consultant (ChFC) CPA/Personal Financial Specialist (CPA/PFS) According to the CFP Board of Standards, Inc., there are more than 88 different financial planning and financial planning related credentials. The three above represent the most comprehensive and widely recognized credentials. There are approximately 45,000 CFP® professionals, more than 40,000 people have graduated from the American Colleges ChFC courses, and there are about 3,000 CPA/PFS professionals. 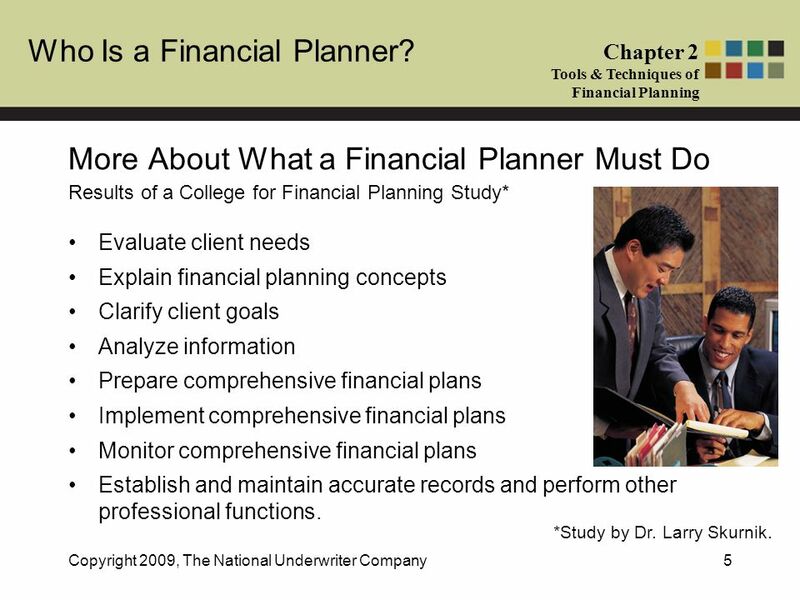 Download ppt "Who Is a Financial Planner? 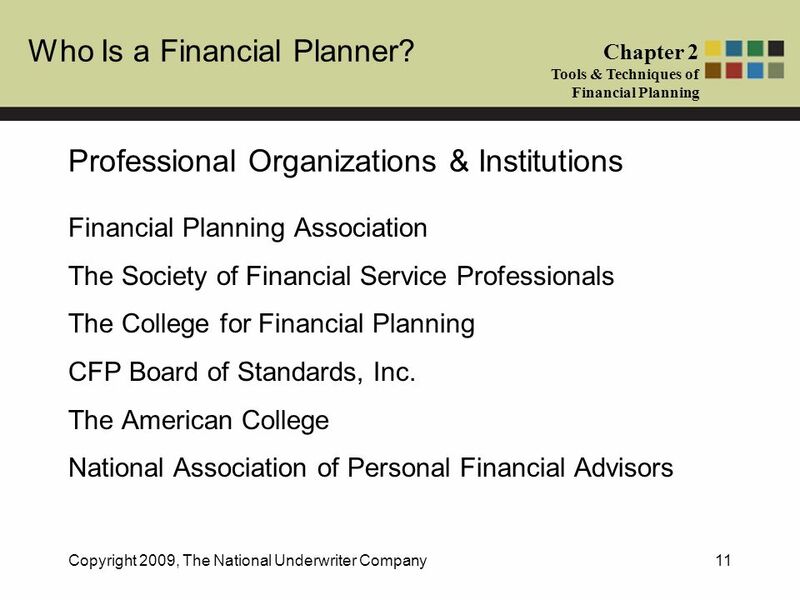 Chapter 2 Tools & Techniques of Financial Planning Copyright 2009, The National Underwriter Company1 Professional Financial." MONEY WORKS FOR WOMEN CHOOSING A FINANCIAL PROFESSIONAL. D3 Financial Counselors What we do for our Clients. C ERTIFIED F INANCIAL P LANNER ™ Certification Insert presenter’s name, Institution name & Date of presentation. © 2008 Business Enterprise Institute, Inc. Business Section of the Utah Bar Association The Exit Planning Executive Briefing February 9, 2011 Presented. Measuring Your Financial Health and Making a Plan. Financial Planning Presented by UMA KUMARAVELAN, CFP CM 101 CFP CM, CERTIFIED FINANCIAL PLANNER™ and federally registered CFP (with flame design) ® are. © 2007 ME™ (Your Money Education Resource™) Estate Planning for Financial Planners Chapter 1: Introduction to Estate Planning. © 2013 All materials are proprietary. I. Richard Ploss, Esq. CPA, CFP © Preti Flaherty Beliveau & Pachios, LLP Financial Planning— Standards, Ethics and. Financial Planning Presented by Christian Koch, CFP  101 CFP ®, CERTIFIED FINANCIAL PLANNER™ and federally registered CFP (with flame design) ® are certification. Take the Pulse of Your Financial Future prepared by Financial Planning Standards Council (FPSC) Name, DESIGNATION Title, Company Name Date. Personal Finance Chapter 1: Understanding Personal Finance. Matthew J Burke, CFP Field Vice President. Quality Advice Financial Planning American Express Financial Advisors American Express Financial Advisors.